Griswold Home Care is just one of the clients we've had the pleasure of working with during Year One as SPRYTE Communications. 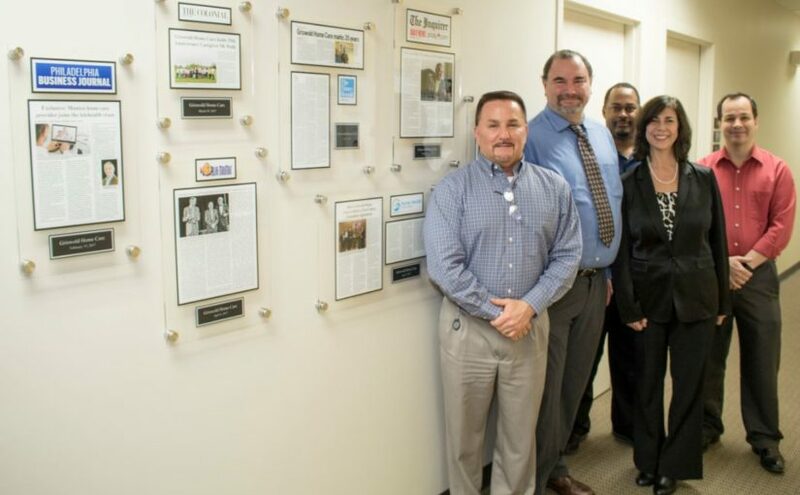 Standing (left to right) next to a wall of framed media placements we earned on behalf of Griswold are Mike Magid, Griswold COO; Gary Frisch, SPRYTE Account Director; Ron Patterson, Griswold VP of Marketing & Information Technology; Lisa Simon, SPRYTE CEO; and Michael Haldeman, Griswold Senior Graphic Designer. Think about it: when a public relations agency has its own news, there’s inherent pressure to obtain earned media coverage. Why? So, we can enjoy the credibility that comes with a third party agreeing that our corporate action is newsworthy, and so we can be our own example of the power of publicity. That was the case a year ago, when after two years of planning and investment, Simon PR, a general PR firm of more than a quarter century, became SPRYTE Communications, a healthcare marketing specialist. Tomorrow is SPRYTE’s one-year anniversary. In addition to our firm’s new web site, search engine optimization (SEO) investment, social media channels and automated marketing strategy, generating earned media was central to our launch. And the resulting earned media campaign gave the news of our new brand credibility while creating buzz and spreading the word. With an exclusive, the Philadelphia Business Journal broke our news on January 23rd. Because of the preparation we did for the interview, the feature length online story included our key launch messages. But it didn’t stop there. We were delighted that reporter Ken Hilario continued to reference SPRYTE’s launch in stories about other agencies throughout the year. Our agency news was also placed in a variety of print and online media outlets including special interest and grassroots targets like the newsletters of the many associations we belong to and the hometown newspaper of the CEO. We attempted to leave no stone unturned even though, as with any earned media campaign, there were disappointments. Please check out the results from the SPRYTE Communications launch earned media campaign. How do you think we did? We’re the first to admit that we come from a conventional public relations tradition where the primary deliverable is earned media. We thrived in this world for nearly three decades and will continue to up our proficiency as we grow with our clients. But it was clear years before our launch of SPRYTE that we’d better embrace digital marketing, and pronto! Actually, one of the drivers behind the rebranding was our opportunity to start with a fresh canvas and to offer services that we weren’t known for but were increasingly proficient in, including social media management and digital content marketing. Most of all, we weren’t known for healthcare public relations even though more than 35 percent of our business has always been in healthcare and we’ve worked on many award winning campaigns with highly notable healthcare brands. Our team also has experience working in-house in health systems, at big agencies on large healthcare accounts and in big pharma corporate communications bureaus. It makes sense! We are headquartered in Philadelphia, a healthcare capital, with a satellite office in New Jersey, along the life sciences corridor. Grown with healthcare automated marketing. We edit several e-newsletters for highly-regarded physician practices. We invested in learning about federal anti-spam laws and patient privacy. This work plays to our strengths as writers and project managers. Also playing to our strengths as writers and project managers is our growing proficiency in managing and populating healthcare providers’ social media channels. We also invested in a social media management dashboard to better serve our business in this lane. Writing blogs targeted to the healthcare practitioner as part of healthcare providers’ content marketing strategies is a skill we’ve been perfecting as SPRYTE with very seasoned pros on our team who also have life experience and sensitivity to the topics at hand. As we reflect on a year as the new us, there’s a lot to celebrate at SPRYTE. There’s also a lot to be humble about as the marketplace increases in fragmentation and competition. We’ve been blessed with excellent opportunities in healthcare and we don’t take them for granted for a minute. With as much business experience as we have, we know we must continue to impress while showing passion for the healthcare industries we serve and embracing all the new tools we must deploy to achieve our clients’ business goals. Here’s to another successful year as SPRYTE Communications! No Online Presence? That’s Anti-Social! It seems that just about everyone is on social media these days. Some cannot get enough of it while others detest it. Regardless of how you feel about it as a healthcare communicator, you can no longer deny its place in modern society and have to view it as a valuable tool. It’s like the old saying “If you can’t beat ‘em, join ‘em.” Current numbers suggest social media is used by more than 80 percent of the population. This percentage has been increasing by about 5 percent every year. With this in mind, SPRYTE Communications recently partnered with South Jersey Holistic, the practice of Polina Karmazin, MD, a medical doctor and area expert in the field of homeopathic medicine. South Jersey Holistic had a loyal but somewhat small patient base and no real presence outside of its physical location. Through consultation, a plan was developed to build a social media presence. With Facebook still reigning as the most popular social media platform, this was our starting point. In addition to building out the profile and preparing content, a routine was created under which postings would go up daily and in support of the practice’s core treatment offerings. In 90 days, the practice’s Facebook following grew from 0 to 138. The page currently has 156 followers. Boosted posts were also used with great success. One in particular reached nearly 25,000 Facebook users within 25 miles of South Jersey Holistic’s hometown of Voorhees, N.J., and resulted in 199 post clicks. Social media has come a long way. No longer just for posting photos and thinking out loud, platforms such as Facebook influence decisions such as buying a car…or finding a new doctor. That is the real game changer. There has always been a social aspect to buying and, historically, word of mouth was the main means. The personal recommendation was, is and forever will be more powerful than any paid marketing. There is a pervasive myth in which Nordstrom allowed a customer to return snow tires despite the fact they did not sell snow tires. Whether factual or not really doesn’t matter. That the story has been re-told thousands of times is meaningful and supports the Nordstrom “customer-first” brand. That anecdote took years to reach the ears of those thousands of people. Today, one post has the ability to reach more people in a matter of minutes. We have truly moved from word of mouth to word of click. While it’s up to the organization to ensure a positive patient experience, social media can be harnessed to encourage positive reviews…and be subject to critical ones too. With all channels offering the ability to tag others, re-post/retweet and share, testimonials, ideally factual ones, can go a long way on social media platforms. These can be valuable to stimulate conversation and create buzz. But once you have a social media presence, it must be monitored and engaged with. Messages and comments should be addressed quickly. You never want less-than-complimentary commentary hanging out there without a response. Even positive comments should be acknowledged, with something as simple as a thumbs up. This will demonstrate that you are engaged with your followers. Let’s Get Social in 2018! Facebook offers ease of use and is still the most widely used. Twitter has recently expanded its character limit and is therefore more friendly (note: just because you can now use up to 280 characters doesn’t mean you have to). Instagram is the most photo-centric. If you have compelling visuals, Instagram is a great place to be but should be considered complementary to the others, not used in place of them. Regardless of which combination of platforms your medical practice decides to use, make it a goal in 2018 to establish your social media voice. Like South Jersey Holistic, you’ll quickly learn how powerful it can be! It’s often said that it takes work to make a marriage work. Melding two lives, lifestyles and families is a constant challenge. Business relationships are more transactional, working best when each party has an understanding of the others’ specific needs and they can strive together toward a common goal. Media relationships are somewhere in between – often having the transactional nature of the business relationship, but based on a somewhat more intimate level of understanding between the parties involved. It’s through that more intimate level of understanding that you can build a closer connection – in general, and especially in social media. From a media relations standpoint, SPRYTE has found that Twitter offers an excellent avenue and opportunities for achieving a closer connection with print media targets via social media. Being able to build such connections, of course, is part of the PR playbook. To do that, you need to understand a reporter’s needs and interests. What motivates him/her? The best way to start? Simple. Follow them. Spend several days (or weeks) getting to know what topics and stories interest them. What are they writing about? What else are they reading – and sharing via their Twitter feeds? What do their comments tell you about how they think? Maybe you’ll be able to identify some personal characteristics or interests that will come in handy later. Make sure to share articles they write (especially if they involve you or your client), and to accompany the share with a favorable comment of your own (if warranted, naturally). Don’t forget to include to mention “@YourBusinessHandle” in the messaging. More and more media outlets are using social media analytics to gauge the popularity and impact of their news talent, so there can be some real value from their standpoint. Be active, but don’t be obsequious. Direct messaging, of course, can be a great advantage if you and your target reporter follow each other. And once you’ve established the rapport, you can follow-up with email, if it’s more convenient. 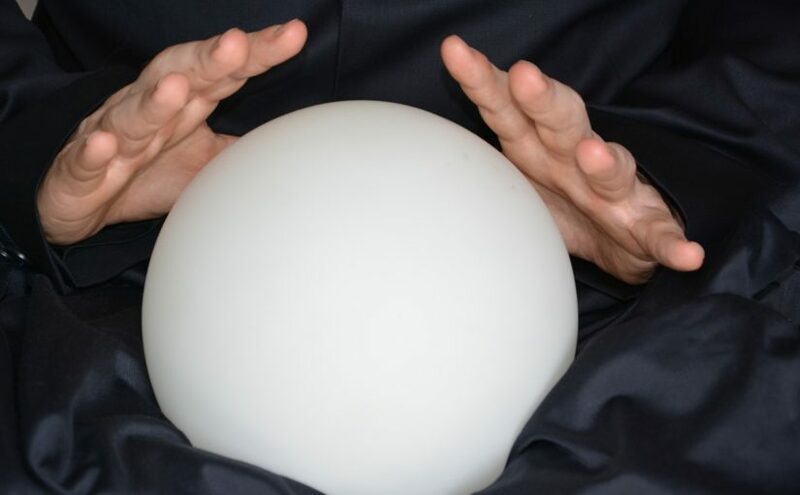 Often, a simple “heads up” about an upcoming event can be enough to spur interest. Not long ago, one of our hospice clients was planning a special Gift of A Day (perfect day realized) for a patient – our client had rented out an old-time movie theater for a special screening of “Singin’ In The Rain” for her and her family. There was also a limo, a red carpet, a professional singer and greeters in yellow raincoats to help lend excitement. The Tweet led to a series of back and forth emails through which we set her up with interviews with family members and client staff, as well as the owners of the theater hosting the event. The result was a huge feature story in the Akron Beacon-Journal on the front page of the community section, complete with color photos of the patient, family, limo, red carpet and raingear-garbed attendants. Could we have done it without Twitter? Probably. But Twitter gave us the ability to quickly review our target, ascertain her interests, and deliver a short, enticing message designed just for her. Twitter can be a time-saver as well as a strategic tool. But like any tool, you need to spend some time and experiment with it in order to become an expert craftsman. The past few years have seen a number of issues and innovations gain prominence in healthcare and the hospice industry. Individualized, patient-centered care, technological advances and a growing ability on the part of patients to actively compare healthcare providers are three of the key trends that healthcare communicators – especially those who work in the hospice industry – are likely to encounter in the months ahead. Beginning January 1, 2016, the Centers for Medicare and Medicaid Services (CMS) began paying physicians to engage in advance care planning conversations with their patients to help them understand and make decisions about their end-of-life treatment preferences. In the first year, approximately 575,000 Medicare recipients took advantage of the new benefit, according to a Kaiser Health News survey – almost twice the number expected. Expect that number to increase in 2018. At the same time, look for an effort to broaden the focus of the conversation. Dr. Tim Ihrig, Chief Medical Officer for Crossroads & Palliative Care (full disclosure: a SPRYTE client), says such conversations should go beyond discussions about extreme treatment measures and do-not-resuscitate orders. Instead, they should empower patients to consider what is most important to them from physical, medical, emotional and spiritual standpoints and use that as a basis for envisioning how they want to live their final days, weeks, months or years. Helping patients understand how palliative care can enhance the quality of their lives as they reach the final stages should be part of that evolving conversation as well. Healthcare communicators need to understand the growing importance of patient-centric, value-based care to help educate patients and their own staff about best practices and what to expect. Over the past few years, the CMS has developed a series of websites aimed at providing consumers with information that will enable them to begin the process of comparing healthcare providers in various sectors, including Physician Compare, Hospital Compare, Nursing Home Compare, and Inpatient Rehabilitation Facility (IRF) Compare. The websites offer a way to compare providers within a geographic area (and against national averages) based on specific quality metrics. In August, 2017, the CMS launched Hospice Compare. The goal was to allow users to sort through hospices based on quality metrics, such as the percentage of patients who were screened for pain, or difficulty breathing, or whether patients’ preferences are being met. Almost immediately, however, the site became the focus of complaints that incorrect information was being provided – incorrect addresses, phone numbers and profit statuses were among the problems identified. In the meantime, healthcare communicators need to be alert to new developments and be ready to provide accurate information about their own organizations on a timely basis. Many people are still surprised when they learn that hospice is not a place, but rather a program designed to help patients with a terminal illness live peacefully and painlessly as they reach the end of life. The growth of telehealth will make the delivery of hospice-related services more accessible and reliable than ever. Nothing, of course, will supplant the value of in-person visits by a nurse or care provider. But the availability of round-the-clock medical monitoring and telecommunications with patients or family members will enable a higher level of quality care for those who are homebound, who lack family support, or who live in very rural or isolated locations. Other technological advancements in the area of virtual reality are already helping to educate providers, support staff, first responders and family members about what it’s like to experience some of the conditions and challenges faced by patients who are elderly, infirm, or dealing with dementia. In fact, during 2017, two of our healthcare clients – Crossroads Hospice and Holy Redeemer Health System – staged “virtual dementia tours” for the benefit of caregivers and family members. Special programs such as this allow healthcare providers to showcase their special knowledge while providing an important educational public service – always a great opportunity for communicators. Additional technology-driven developments are underway – programs to better track opioid use and abuse, enhanced data-driven analytics to help providers in the areas of tracking, documentation and reporting, and improved work management systems that enable providers to offer more timely, efficient care to their patients. No doubt, 2018 will be an exciting time. 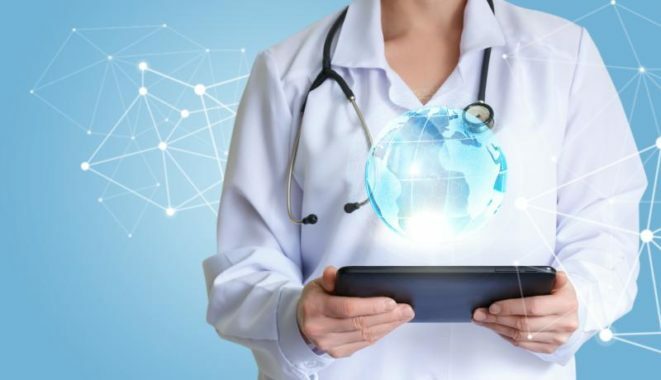 As always, healthcare communicators will need to be alert and constantly aware of the fast-paced developments taking place in their industry and how they can impact their own organizations.